Go to the Homepage for The Flatland Almanack? IMAGE HOSTING BY FLICKR! Thanks, Flickr! Jump to Flickr and get your own account! 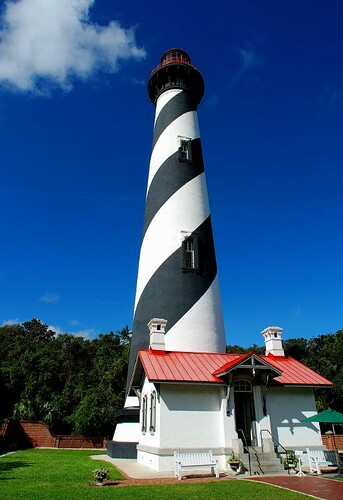 Allen Whitson made this magnificent photograph of the famous St. Augustine Lighthouse. The lighthouse has a reputation for being haunted and I've seen a most intriguing documentary revealing the results of a tape that was left running there overnight. I am using this photograph with the express written permission of the owner. All rights to this photograph are reserved to him. Please do not save or download it without his express written permission. In addition to his glittering or glowing cityscapes, Ralph Orona does beautiful in-her-face studies of Nature manifesting herself subtropically. Or, to be more accurate, he sees God manifesting himself in nature. He writes: "This is an orchid I found glowing this morning at Pinecrest Park in Miami." 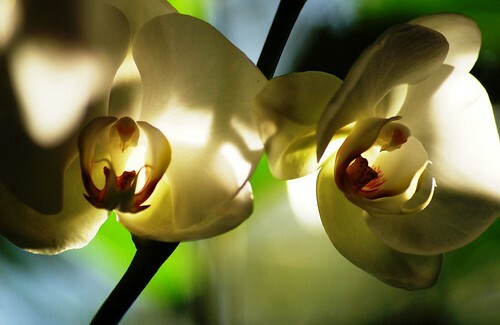 These orchids---filled with light like a pair of translucent lamps so that you can even see their veins---do indeed have a numinous quality. They practically give off a scent: that scent of white petals in the sun. To see this glorious flower in detail, click the link below. Used by permission---all rights reserved to the owner. Please do not save or use without his express written permission.. Photographer Don Jones, who does such amazing night shots and such evocative photos of old Florida houses, took this vintage-feeling and very painterly shot of State Road 404, the Pineda Causeway. 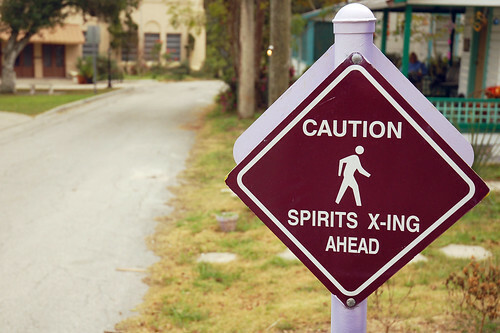 It's the primary access road to Patrick Air Force Base. It made me feel very sentimental when I saw it----it's so like the postcards of Florida from the 1969's, with those pastels and all that intense green. I do not own the rights to this photograph. It is subject to a restricted Creative Commons license, permitting certain limited noncommercial uses. Before using or downloading it, consult the terms of the applicable license. You may view it here. 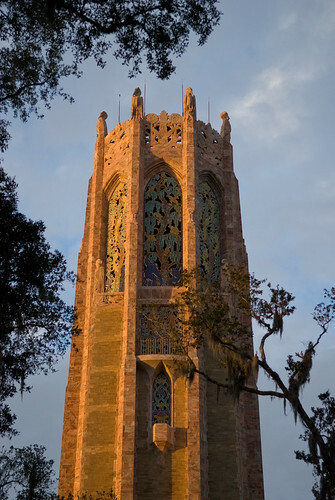 Here is another marvelous photograph of the Bok Sanctuary Carillon Tower----before we had its golden door; now we have the summit reflecting the color of the sun at sunset. Photographer Josh Hallett (Hyku) has produced some wonderful photographs of Central Florida and has kindly authorized me to feature some of them----this is the first I've published, with more to come. I do not own the rights to this photograph, but am using it compliance with a restricted Creative Commons license. Please do not download or use it without first consulting the terms of the applicable license. The link to the license is here. 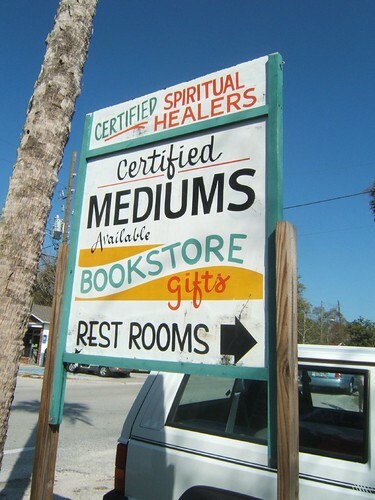 Most non-Floridians don't really seem to have heard about Florida's psychic and spiritualist camp, Cassadaga, hidden away in the pine barrens of Central Florida, within about 50-60 miles of Orlando. You can read more about its history here. Can I just whisper in your ear that I visited it for fun with my friend Frances in 1996? And that the reading I received from the psychic I consulted for 'fun' was weirdly accurate for the next three years? Among other things, she very specifically and clearly described----ignoring my unconcealed skepticism---that (1) my mother would have heart trouble in August, but recover; (2) that I would meet a guy with whom I'd initiate a close friendship---meaning exactly that, a friendship--- that would be very important in my life; (3) that my husband would take a new job in another town that had the word 'Gourmet' in it (the name of the business actually did); that I'd find myself short of money, but would come through it; and much, much else of which not an inkling existed at the time. Furthermore, though I rebuffed her when she asked me if I was an artist----I wasn't, and treated the statement with incredulity----she said she saw me working with 'little multi-colored flowers.' A few weeks later I looked down at the needlepoint I was doing for a one-time-only special gift for my mom: yep, little multi-colored flowers everywhere. I didn't imagine what she told me; I have it all on tape. Yes, I know what you're thinking. Believe me: I know. Frances, on the other hand, didn't have such good luck with hers (if you want to call it good luck). So I don't know. I don't 'believe,' but I can say that I met one person whose predictions turned out to be dead on. I haven't been back; I find I don't want to know what's next with that level of accuracy. It's unsettling and it's also unclear what you do about it once you realize it's happening. In fact, there is nothing you can do really, making foreknowledge an exercise in futility. To paraphrase a character in one of my favorite Ursula LeGuin novels, divination is useful only as an illustration of the uselessness of knowing the right answer to the wrong question. Anyway, I remember the palms and pine trees, and I remember big, somewhat ramshackle houses of somber aspect heavily shaded by live oaks. Like many Central Florida towns, it had a certain bleakness in the perpendicular afternoon light, but as the light mellowed, took on that mysterious late afternoon radiance. 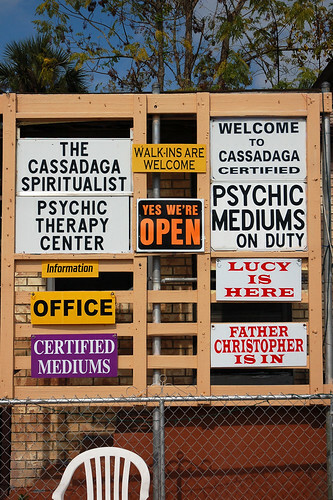 Cassadaga Signs by Niemster (Matthew Niemi) | To see his Flickr photostream, click here | Website: The Niemster | To see the largest version of this photograph available on Flickr, click here | I do not own the rights to this photograph, but am using it in compliance with a restricted Creative Commons license allowing for limited noncommercial use. Before saving or downloading it, please consult the terms of the applicable license. A link to the license is here. 'Eloise in Cassadaga' by Mlle Sarah (Sarah) | To see her Flickr photostream, click here | Website: Pretty Little Bits | To see the largest version of this photograph available on Flickr, click here | I do not own the rights to this photograph, but am using it in compliance with a restricted Creative Commons license allowing for limited noncommercial use. Before saving or downloading it, please consult the terms of the applicable license. A link to the license is here. Um, Sure... by Niemster (Matthew Niemi) To see his Flickr photostream, click here | Website: The Niemster | To see the largest version of this photograph available on Flickr, click here | I do not own the rights to this photograph, but am using it in compliance with a restricted Creative Commons license allowing for limited noncommercial use. Before saving or downloading it, please consult the terms of the applicable license. A link to the license is here. "The photographer writes: "Finally I set my foot on the land of the North American continent :-)) I came here for a few days to attend the scientific conference in Tampa, Florida. On the photo a fragment of the view from my room on the 22nd floor of the Marriott hotel. 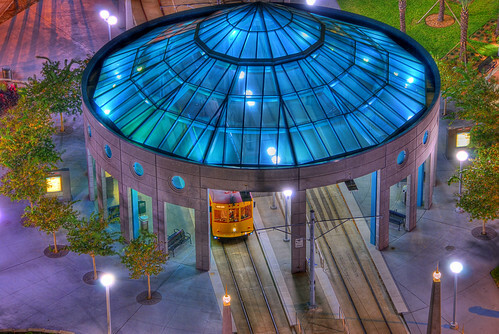 It's a terminal stop of the tram, or as it is called here - street car." I do not own the rights to this photograph, but am using it pursuant to a restricted Creative Commons license. Please do not save or use it without first consulting the terms of the applicable license. The license can be viewed here. More of Caleb's St. Petersburg magic with late afternoon light and color. 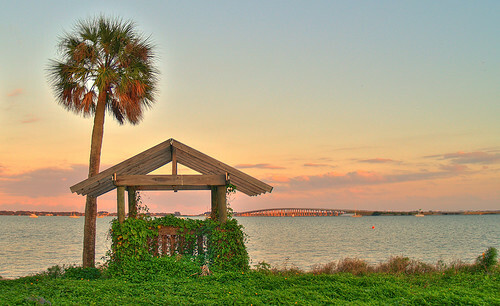 This is my favorite time to photograph in Florida: the colors are so saturated and so intense in that slanting golden light. 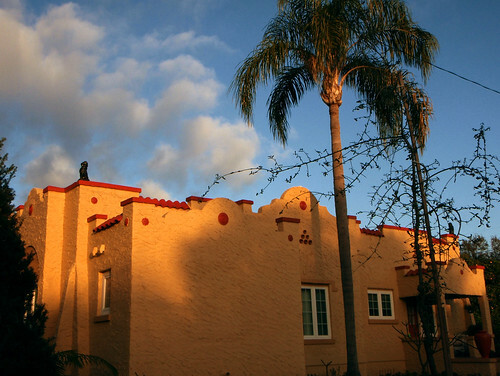 I love the contrasting textures here: the rough apricot-colored stucco with its red roof; the light on the trunk of the palm tree, and behind it all, the beautiful blue of the sky and those delicate silvery-grey clouds. Very painterly, but do painters know about afternoon light and color? When I visited the Keys a couple of years ago, we drove through a sunset much like this one, but for some reason neither of us can now remember didn't pull over to take a photograph. If we had, our camera could not have rendered the scene with this delicacy of detail. For me, it's the pattern of the leaves against the serene blue of the sky that really sets this one apart from other Florida sunsets---that and the shimmer of apricot in the water. 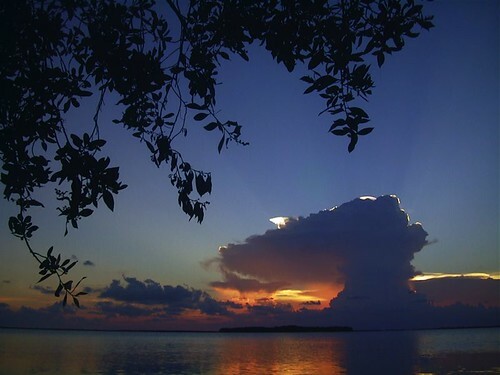 This is another of those Florida sunsets you have to be careful of. The ineffable beauty just might be too much for you. I do not own the rights to this photograph, but am using it in compliance with a restricted Creative Commons license which allows limited noncommercial use. Do not save or download it without consulting the terms of the license (shown here). Photographer Caleb clearly loves that certain slant of afternoon light as much as I do. Look at the way the light shines along the crenellations (?) 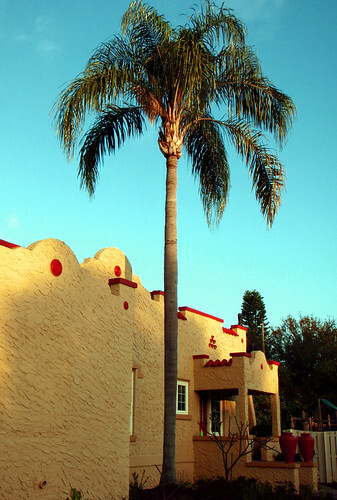 at the top of this beautiful Spanish style house and along the trunk of the palm tree and in the palm branches. Note how the sky fades from blue to that watery Gulf-green. Look at the two dark red jars. Here's a scene from the pretty little town of Melrose (Putnam County). 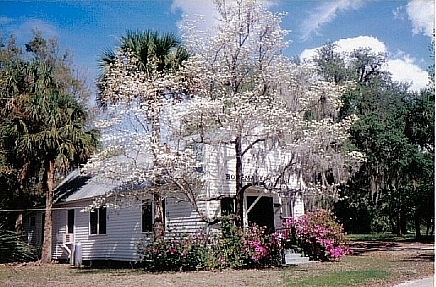 This building was once a church; back when I took this---in dogwood and azalea season---it was a Homemaker's Club. Isn't it pretty?